This is our custom-built XLRF to D-Sub 15 Male top quality 4 channel AES/EBU Digital Mogami snake cable (Return configuration). You won't find a nicer snake anywhere. 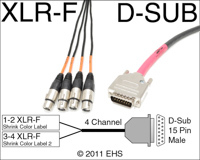 Construction is Neutrik XLRF and Male DB-15 with Mogami 3161 cable, fan-out wires with braided sleeve for protection, connectors with shrink tubing for color code and strain relief, and number label. Neutrik connectors are some of the best connectors around, with no screws to fall out after years of abuse. Mogami wire is (as far as I'm concerned) the best wire, used in the best studios for it's ultimate sound qualities and durability. Mogami 3161 cable is very flexible, durable, heavy-weight cable. Optional colored boots for connector ID. Pick one color for all or "Multi Color" for multi color ID using standard color code. Select fanout length: Normal length is approximately 10 inch. Metal D-Sub Hood: Ultra heavy duty metal hood with thumbscrews, Metal offer extreme durability and RFI/EMI protection. Metric: Fairly uncommon, we are working on a list of companies that use metric and the only so far is Apogee. If you need different options please contact us. If you are unsure about your gear's pinout please contact us and we'll look it up. Photo 1 shows the two ends with orange shrink color labels and visual wiring layout. Photo 2 shows expanded view of the two ends with orange shrink color labels and red master.